Most people have four wisdom teeth. They can erupt anytime between the mid teen years to the late 20’s. While some people have no problem with these third molars, others experience significant pain or complications. 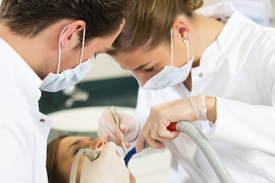 Our dentists are fully qualified to evaluate how your wisdom teeth are erupting or if they are unable to erupt. After a thorough examination, we’ll give you all our findings and can help you decide what the best plan of action is for your continued dental health. It’s essential that you don’t ignore your wisdom teeth. Proactively removing the wisdom tooth can prevent additional damage to your other healthy teeth. If left untreated, your wisdom teeth can push your other teeth out of alignment, causing pain, damage and even affecting your jaw, sinuses and gums. Wisdom tooth removals are a family standard procedure at Dental Link.We’re well-versed in performing the removal while minimising your discomfort and advising you on proper aftercare. In more complex cases, we may refer our patients to a local oral surgeon. However, we are happy to provide comfortable removal along with the aid of sedation dentistry upon request. To find out if your wisdom teeth need to be removed, contact our dentists to schedule an x-ray and evaluation. Financing plans are available and insurance is accepted and processed on the spot with HICAPS.